I'll have to join you one day and and open a Tower in the UK for your pilots. I'll post a new version when I get the time to look over it. Good morning, my colleague flightsimmer. It strikes me that with the new version v.2.1.0.1 you no longer want to open the "Debug" window. 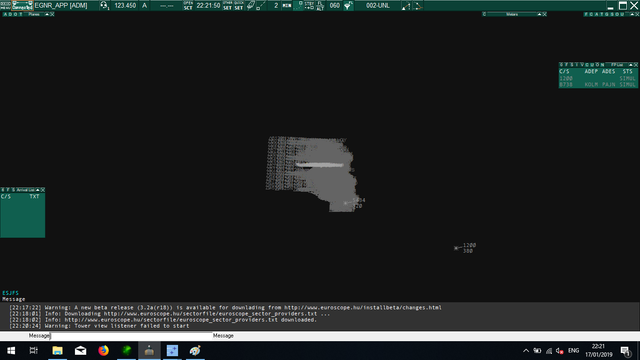 Furthermore, it strikes me that in the lower left corner of Euroscope the message ESJSF is no longer visible, but as far as I can see it, Euroscope is working normally. What is the function of "Registration Only" in the ESJFS2018 window? Can I also ask you about JoinFS? Are there ristrictions as father and son with two differences the machines log into JoinFS with the "seeing". Keep smiling and healthy best friend. jopie_60 wrote: It strikes me that with the new version v.2.1.0.1 you no longer want to open the "Debug" window. The error log file will only show errors. The Debug window will show what is happening. For Example: the Debug window will show when an aircraft position has been sent. This is not an error, so will not show in the log file. jopie_60 wrote: Furthermore, it strikes me that in the lower left corner of Euroscope the message ESJSF is no longer visible, but as far as I can see it, Euroscope is working normally. That message should be visible when Euroscope connects. 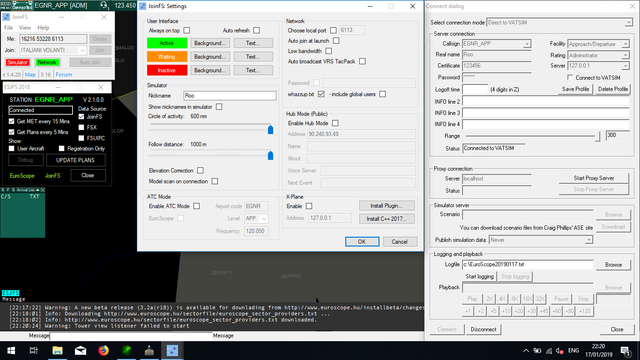 Is VATSIM ticked in the Euroscope connection window? If the scope is working as you expect, I would ignore the issue. jopie_60 wrote: What is the function of "Registration Only" in the ESJFS2018 window? If an aircraft has set both a callsign and Tail number in their SIM, Registration Only will show the Tail Number not the callsign on the scope. jopie_60 wrote: Can I also ask you about JoinFS? I'm probably not your man for most JoinFS queries. I'd start a new post on the forum. I use ESJFS and Euroscope when controlling my guys and have found that it works very well. I DO see the "ESJFS" at the lower left. Rather than rely on either registration or tail number, I have found that it is easier to have each player "Squawk" an individual IFF code. (Mode 3) This will show in the player's "Tag" and is easier for me to identify in a crowded environment. Once identified I Assume them, which then shows the callsign they are using. Trying to get this running, have downloaded your latest version, followed yor connection instructions, but see no A/C. I was talking to them in our TS. Running ES3.2; joinFS1.4.20; windows 7.
online; opened Joinfs - CIX open server; opened ESJFS; opened ES at EGKA-TWR connected as advised. ESJFS connected with ES; Joinfs network green; nothing. I may have a problem with ESJFS. 1. the 'panel' looks nothing like your screenshot on page1. 2 . Ihave 6 tick boxes, 2 open boxes, the one lower right closes the programme and ond titled update planes. When connected to ES 'euroscope appears bottom left in pale green; there is a top banner showing (white on blkack 'waiting for a connection/connected. The remainder is white - no labels for the tick boxes, they change what appears to be a stau text very bottom right, but don't appear to do anything. Nice to see another Virtual ATCO. I was thinking about this program the other day on how I could rewrite it to make it easier, which I will do after I'm happy with the voice apps. I can confirm it does work as I use it now and then. I'll have to get around to writing a small tutorial for it. I changed it a lot since I took that initial screenshot, so don't worry that it looks different. Something definitely doesn't sound right if there are no labels. It sounds like Euroscope hasn't connected to ESJFS at the moment. What IP did you enter in Euroscope? 127.0.0.1 or localhost should work. Is the VATSIM tick box in Euroscope ticked? Off the top of my head it shouldn't be. One of the buttons should say DEBUG and will open up a console window to tell you what is or isn't happening. These are the settings I'm using below just now. There are only 2 aircraft on the JoinFS hub I'm connected to, so I had to zoom out to see them. 1. The ESJFS welcome msge did come up in ES. I got the metar to display in ES and fired up the voice ATIS ok, but it would only activate the text. Not able to try for an A/C, nobody about. 1. If you get the message you are all working and connected, great. 2.Username/Nickname shouldn't matter, I think this will be a coincidence that it worked when they were set the same. The callsign in Euroscope is important. The first 4 characters MUST be the ICAO code for the airfield you are controlling. The Debug button will only work if you click it after ESJFS has opened and before you connect Euroscope. It was an after thought which I'll correct when I get around to a rewrite. As you are not connected to an FSD server (like vatsim) you will notice features missing. The voice services in Euroscope are for the VATSIM Voice servers And so will not work whilst viewing JoinFS traffic. Although I told it to get the latest real world METAR, It will only get the METAR for your airport ( hence the callsign importance). You won't be able to coordinate with other controllers through Euroscope and certain information will be missing from flight plans. But the information it does show will be the latest and correct. If you tick Global whazzup in JoinFS you will see all users. Although those users not on the same hub as you will not update at the right interval to be controlled. In other words they update around every 60seconds where as users on the same hub as you update around every 3-4 seconds to make for a realistic radar sweep.